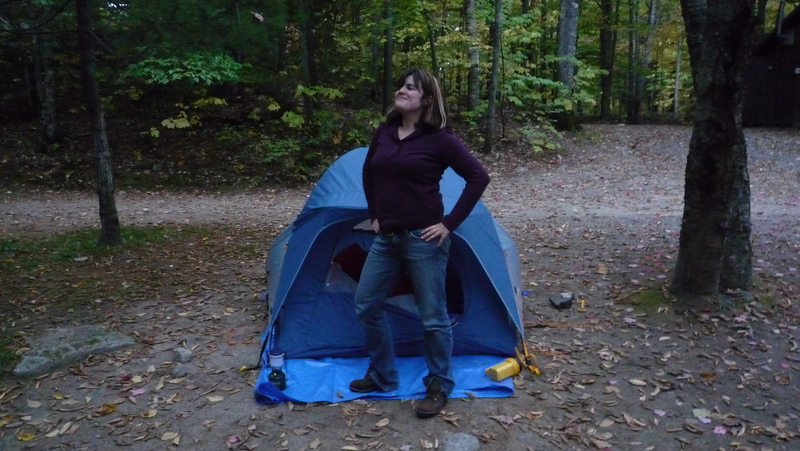 This is Nicole in her patented I conquered the camp pose. This weekend, I’m heading off on a frugal vacation (and no, I’m not talking a staycation- those aren’t even real). Chef Dan and I are off camping in the great North Maine woods! First of all, camping is an excellent way to test any relationship, romantic or otherwise. Bugs, low blood sugar, temperature variations, lack of sleep… the whole thing really puts everyone on their best behavior. Second, you get to battle the elements and otherwise work harder than you normally do at tasks like cooking meals and keeping your living area clean and bear-free. 1. Go during off-peak times. Notice we are not going camping on a major holiday weekend? Actually most campgrounds only open towards the end of May (at least my neck of the woods) so before that, a lot of places end up being free or really cheap. Dan and I are headed towards Katahdin Iron Works, which is a historic site close to Gulf Hagas (self-titled the ‘Grand Canyon of Maine’), Moosehead Lake, and two state park campgrounds. 2. Borrow equipment. Why buy all the fanciest equipment? Unless you go regularly, do you really need a lantern with ten light settings or a three ply Gortex tent rated for 50 below zero? Borrow things you might not own like a tent, portable grill, cooler, or even tarps from people you know. Just remember to return it in good condition and send a thank you note or email after. It’s just the nice thing to do. 4. Cook your own meals but don’t overbuy food. Nothing like standing in a grocery store aisle wearing flannel, knowing that you’re headed out of civilization. You get in total gatherer mode. This is where coming up with a list of needed ingredients for each meal and snack, and sticking to it, will help you out. Bonus is you won’t have to haul the three kinds of Oreos into the woods and then the two bags you have left home and into your house. Sure, you can justify the extra calorie consumption while hiking but you don’t want these kind of prepackaged, fattening, and relatively expensive food items as leftovers. 5. Be safe. Please, in the name of saving money, don’t do anything stupid. Have emergency supplies, a contact person on the outside you can check in with, and a buddy. And now campfire story time: What’s the stupidest and or biggest money wasting thing you ever did in the name of the great outdoors? I love camping! We try to get out for weekends when possible (and when the weather allows; it rains a lot here). For the past 9 years, we have been going for a full week with a big group of families, but I have learned that as much as we enjoy campfires, cooking outdoors and the extremely simple life, try as we might we cannot live that long in a tent. We have 5 people, 3 dogs, it rains at least one day if not more so everything gets muddy, so we always end up leaving early. This year we broke down and reserved a trailer so we can stay the entire week, but I have been saving for it so it won’t break our budget. Otherwise we will stick to our tent and basic camping. We’re getting better about not over-buying food before we go, but it’s taken a lot of practice. I would still rather be overstocked when I go then find out I didn’t bring enough. .-= Laura´s last blog ..Frugal Recipe of the Week: Coleslaw Three Ways =-. I love being outdoors, but I have to admit that I’m a wimp about camping in a tent. However, staying at campgrounds is a popular vacation activity in France, and we love to rent a mobile-home for a week in the summer and do our own version of “camping out”–which still includes hiking and outdoor meals, but has a comfy bed, too. I love camping, but haven’t really attempted it with kids. The last place we went was in the south of France in the middle of July. It was hot, hot, hot! And it wasn’t even a real campground- it was one of those 3 star French campgrounds where you drive in, and pitch a tent on a square plot of dirt next to trailers that have flowers growing in front, which is how civilized it gets. It was a bad time (did I mention it was hot? ), as the kids were too little, we didn’t have good sleeping mats and I got a bladder infection from sitting in the pool so much. Blech. Most of my camping has been with kids. I learned early on that they get extra hungry when camping. They eat stuff that they avoid like the plague at home (silly things like fresh fruit.) I learned to limit the sweets and bulk up on the good stuff and the kids slept better. through the Boy Scouts I learned that they will eat the ham and Grilled cheese sandwiches made on 99cents bread just as well as the $3 stuff and I an afford extra sandwiches that way. The kids taught me a lot. I also learned that I cannot sleep without a pad under my sleeping bag. Year round here in Colorado it is just too cold to have the ground leach that much heat out of me. The third thing I learned to always to remember is that at the end of a weekend there would always be a hot shower. So, I could get dirty and the shower and the washing machine would make all things right again. Good stuff! I love camping but also am quite frugal. I agree with borrowing equipment, though it’s quite possible especially if you’re camping with children, that the equipment gets damaged. Walmart and Amazon have great deals on camping equipment so you’re investment won’t be that much when compared to traditional hotel rates. In terms of biggest money waster, well I have to rent my wife a cabin or she won’t even come camping with us. It’s not exactly wasting money but it sure does cost a lot! .-= Eric´s last blog ..8 Things To Take Camping That You’ve Probably Never Thought Of =-.